Winter Fountains (2017) by Jennifer Steinkamp. Photo © James Ewing Photography. Your gift will support the world premiere of Winter Fountains in Philadelphia. For Parkway 100, the centennial celebration of Philadelphia’s Benjamin Franklin Parkway, the Parkway Council presents Jennifer Steinkamp‘s Winter Fountains, a major installation commissioned by the Association for Public Art (aPA). 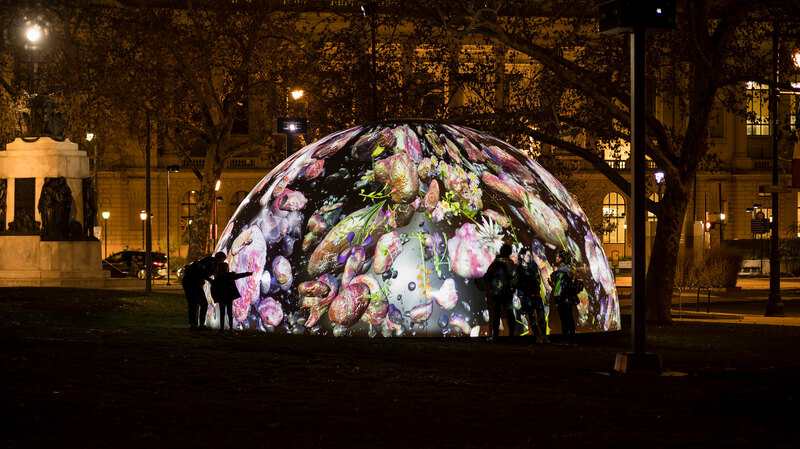 Inspired by the signature fountains of the Parkway, the installation features four 13ft-high and 26ft-wide architectural domes – metaphorical winter fountains – that glow with Steinkamp’s phantasmagoric and dream-like animated video projections. Eight digital animations are projected onto the surface of the domes in distinct hues, whether cool green or blue, or warm red/pink or yellow. The imagery reimagines the formation of electricity in clouds, inspired by Benjamin Franklin’s research and evoking the art and science explorations represented by the Parkway institutions. It’s a celebration of scientific inquiry. Jennifer Steinkamp is an American installation artist who works with video and new media to explore ideas about architectural space, motion, and perception. She is currently a professor in the department of Design Media Arts at UCLA. Jennifer Steinkamp has participated in such noted exhibitions as Time Square Arts: Midnight Moment (2016), Prospect. 2 in New Orleans (2013) and executed a range of commissions, included the projection work 6EQUJ5 on the central dome of the Minneapolis Institute of Art. Her installation art has been the subject of exhibitions at the Los Angeles County Museum of Art; the Museum of Contemporary Art, San Diego; and MassMoCA, North Adams, Massachusetts; among other venues. ;and has toured with the band U2. Winter Fountains for the Parkway is presented by the Parkway Council and commissioned by the Association for Public Art (aPA) for Parkway 100 in Philadelphia, with major support from the William Penn Foundation. Additional support is provided by the Association for Public Art (aPA); The Logan, Philadelphia’s Hotel; and individual donors. In-kind support is provided by Visit Philadelphia, Pennoni, and The Franklin Institute. Our partners include the City of Philadelphia and Philadelphia Parks & Recreation. Parkway 100 is also made possible through the generous leadership support of PECO, PNC Bank, and 6abc. A centerpiece for the Parkway 100 celebration, Jennifer Steinkamp’s Winter Fountains will glow along the Benjamin Franklin Parkway with the artist’s dream-like digital animations.